The triumphs and the tragedies; Rock Case Studies is a complete review of all Queens albums from their debut to Innuendo. Reams of archival interview and performance footage are explored by critics and music journalists. 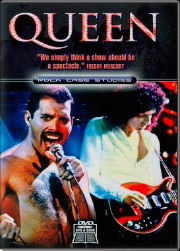 Top live footage includes Queen Live in Rainbow 1974, Live in Hammersmith Odeon 1975, Live in Argentina 1981, Live in Japan 1982; Live in Rio De Janeiro; Live Aid 1985 and much more! We also have an exclusive interview with Jeff Griffin; the producer of Queens BBC sessions and key member of the Live Aid team, plus the expert insights of seasoned musician and music producer, Les Davidson as he gets to grips with the mechanics of the music that made the band so successful.